This unique medieval Arabic manuscript, which contains 96 miniatures, has often attracted the attention of researchers but has never before been subjected to such a thorough analysis. 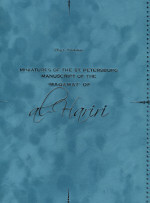 The author has investigated the features of the pictures and the compositon of the miniatures, thereby disclosing yet another aspect of Arab artistic culture. On February 15–16, 2018, the international academic conference "The Turko-Mongol World: History and Culture" in memoriam of S. G. Klyashtorny (1928–2014), will be held.